Happy Friday! I am doing the happy dance for so many reasons this morning. My wonderful husband is turning 31 today! It is a long weekend –no school today or Monday. The snow has left Nebraska and we have sunny skies and warm temperatures ahead of us. Yay! I took the easy way out and bought some challah bread from Whole Foods feel free to make your own though. If you’re in Omaha I found out Whole Foods bakes their challah fresh on Thursdays. I made strawberries and cream,Â NutellaÂ and strawberries, and blueberries and cream. Set your cream cheese out to soften and come to room temperature. Also set out your berries. If you do this it will take the chill off of them and help so your French toast filling isn’t cold. Slice the bread in 1 1/2 inch slices. Preheat the griddle or cast iron skillet over medium. Mix together eggs and milk. Set aside. 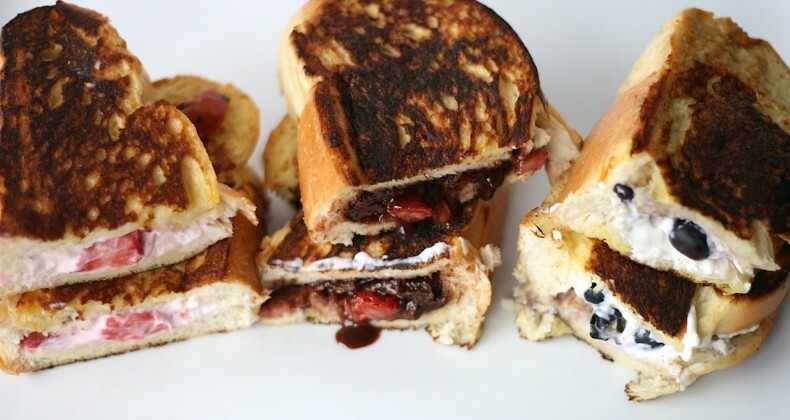 Mix together 2 ounces cream cheese with strawberries, 2 ounces with blueberries, and the strawberries with the Nutella. Take 1 slice of bread and slice it almost all the way through to create a pocket for the stuffing. Spread 1-2 tablespoons of fruit and cream cheese mixture or Nutella and fruit mixture into the pocket. Dip the bread into the egg mixture coating both sides. Toast the bread in a greased cast iron skillet or griddle over medium heat. Cook 4-5 minutes per side or until golden brown. Serve as is or with butter and syrup. Enjoy!